You've never seen the constellations like this before. NASA scientists have re-envisioned the shapes in the night sky using data from the Fermi Gamma-ray Space Telescope, putting a modern twist on the age-old practice. 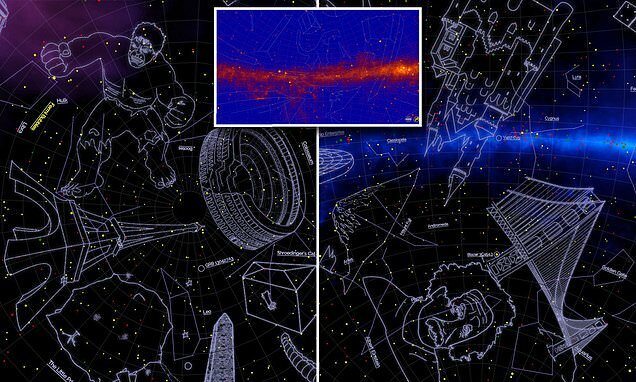 Unlike the official 88 constellations, however, which are made up of recognizable forms created by the brightest stars, the new constellations map out the highest-energy form of light in the universe: gamma rays. The space agency has released an interactive website showing the different gamma-ray constellations in the sky, revealing everything from the Albert Einstein to the USS Enterprise. 'Developing these unofficial constellations was a fun way to highlight a decade of Fermi's accomplishments,' said Julie McEnergy, the Fermi project scientist at NASA's Goddard Space Flight Center. According to NASA, some of the characters in the new constellation came about as the result of a gamma-ray experiment gone wrong. The series includes the Little Prince, the TARDIS from 'Doctor Who,' Godzilla and his heat ray, the antimatter-powered U.S.S. Enterprise from 'Star Trek: The Original Series' and the Hulk, along with several landmarks from countries involved in the Fermi project.